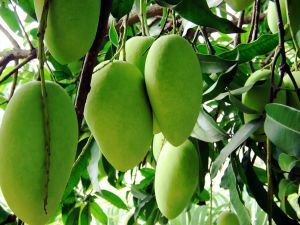 Mango is the national fruit of India and there are various ways to consume it : raw, in chutneys, as a smoothie ( yoghurt and ripe mango blended ), as aam ras( milk, sugar and ripe mango), cut ripe fruit, mango powder for cooking etc. Harvest time is summer. Consuming seasonal fruits is one of the best ways to enjoy a particular season. Year round availability of certain foods which are flown from around the world sounds great but our bodies do better with seasonal foods instead as per the climate zone that we are in. Mangoes are rich in vitamins and essential minerals. They are low on sodium, saturated fats and cholesterol and are essentially carbohydrates with a small percentage of protein. Raw mangoes offer good doses of Vitamin C, A and K. A refreshing summer drink is made with them called ‘panna’. Here’s the recipe for unsweetened panna- and is not as sour as you may think. On the other hand, it is refreshing,flavourful and very healthy. When the sun is strong and the weather is hot, an aam panna relaxes and rejuvenates our tired bodies. It also allows us to enjoy the summer keeping us from dehydration. 4. Water – 1 cup for each mango -to boil , as per servings required to blend. Wash and boil the mangoes ( 1 cup water for 1 mango) till tender( or pressure cook for 3-4 minutes). Finely chop coriander and mint leaves together and keep aside. Peel the mango skin and remove all the pulp from the mango and mix in the water used to boil them. Put this mixture in the blender and add the chopped leaves. Add cold water as per servings required to this concentrate and serve with crushed ice. Note : Adding cold water and ice is as per personal choice. One can enjoy the panna even at room temperature or mildly cold. This entry was posted in Recipes and tagged aam panna, healthy summer drink, mango drink, unsweetend panna. Bookmark the permalink. and my followers really enjoyed it. Keep up the great work!